Corticobasal degeneration (CBD) – also known as corticobasal ganglionic degeneration (CBGD) – is a rare (occurs in less than 1% of the population) and progressive form of dementia. The onset of symptoms typically occurs after the age of 60 and the average duration of the disease from onset of symptoms to death is six years. Although the underlying cause of CBD is unknown, what is known is that CBD is the result of extensive and severe damage in multiple areas of the brain. Research into this form of dementia is relatively new (it was discovered in 1968), but the most current research has found that there are similar, but not identical, changes in the brain protein tau to the changes observed in progressive supranuclear palsy and Pick’s Disease. 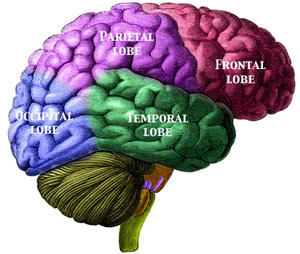 These areas of the brain where damage is extensive include the cortex (especially in the frontal lobe and parietal lobes) and the deep-brain basal ganglia region of the brain, with the hallmark feature in that area being significant neuron degeneration and the loss of pigment in dopaminergic neurons (signifying a decrease in dopamine production) in the substantia nigra, which controls movement. Dopamine is a chemical produced by the brain (a neurotransmitter) that plays a leading role in movement, memory, pleasure, cognition, behavior, attention, sleep, and mood. 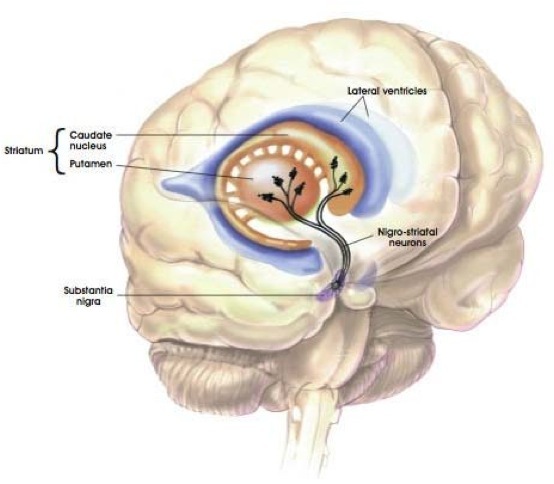 When dopamine production decreases in the substantia nigra, movement is severely affected. Often this is the first visible symptom of CBD. It presents as stiff movement, shaky movement, jerky movement, slow movement, and increased lack of balance, increased lack of coordination, and clumsiness. Generally, movement problems affect one side of the body almost exclusively, but as CBD progresses, both sides of the body are affected. Since these movement disorders can mimic both Parkinson’s Disease and the effects of a deep-brain stroke – one of the classic movement disorders associated with these is ideomotor apraxia (a common example is the inability to initiate walking where the foot seems to be stuck to the floor and can’t be lifted spontaneously to take a step forward) – those must be ruled out as the causes of the movement disorders. Other early symptoms of CBD can include difficulty controlling the mouth muscles, cognition problems, and behavioral problems. Language and speech difficulties – dysphasia (an impaired ability to understand or use the spoken word) and dysarithia (an impaired ability to clearly articulate the spoken word) – are also early CBD symptoms. It is not unusual for CBD to be initially diagnosed, if the first symptoms are cognitive impairment and/or behavioral issues, as Alzheimer’s Disease or frontotemporal dementia. Similarly, if movement disorders are the first symptoms, CBD is often initially diagnosed as Parkinson’s Disease. However, a clear diagnosis of CBD is usually made when both movement disorders and cognitive impairment and/or behavior problems appear simultaneously. There is no known treatment for CBD. Unlike Parkinson’s Disease where dopamine-enhancing or dopamine-mimicking medications prove to be effective for some of the duration of the disease, these drugs have proven to be ineffective for treating CBD (this is likely because of the very different pathologies in the development and progression of the two diseases). In the early stages of CBD, speech therapy and physical therapy may help with communication and stiffness and movement. However, as the disease progresses, these will become less effective and, in the end stage, they will be completely ineffective. Because of the increased rigidity and lack of muscle coordination and use as CBD progresses, usually within five years of onset, sufferers will be unable to swallow and will be completely immobile. Even before this, though, one of the potentially-fatal risks associated with CDB is aspiration of food into the lungs because of impaired swallowing and the high likelihood of pneumonia as a result. While a feeding tube may be considered as an alternative when CBD has progressed to the point where swallowing is significantly affected, it is, in my opinion, inhumane because it only prolongs the suffering from a disease that is ultimately fatal. This is a quality-of-life choice. I can’t imagine for myself a life prolonged where I am completely immobile and completely dependent on everyone else for everything and I can do nothing for myself. A feeding tube would be my worst nightmare. And for me, it would be the most cruel thing those in charge of making medical decisions for me could do to me. Fortunately, I already have all my documents in place to make sure this can’t and won’t happen to me when and if the time comes that the choice needs to be made, because I’ve already made the choices. So, as an aside, I would strongly urge everyone who reads this to get your wishes formalized and signed and communicated so that you have control over the end game of your life in this area. Not only is the wise and prudent thing to do, but it eliminates the agony of wondering what to do so often seen in families where the person affected never talked about what he or she wanted and never took the time to answer these questions when he or she could. Thanks again for sharing Sandra! You’re very welcome, Judy! And thank you so much for reading and commenting. I can’t tell you how much I appreciate you doing that. Love you! Hi I am a caregiver to a lady with this disease . This weekend I have noticed she is much stiffer and a little harder to move . She is in hospice care but at home . We still maintain a normal as we can attitude emotions are getting more crying more . She I’m not sure she’s had this 5 years . Physical therapy has stopped so has speech and swallowing as well . Thank you for putting a name to a face . She does have alien limb and her hubby has asked me many times if it’s from the disease and I said yes . I don’t like this disease it hit her just boom her hubby said . She has never questioned why . But at this time the sweetheart is in good hands with all of us outside caregivers although it’s hard on the family caregivers . I am so glad this lady, her husband, and her family have such a wonderful team of caregivers, including you, to assist them. This is a rare type of dementia, but everyone who has commented about their loved ones with CBD talks about many same things you did. God bless each of you and this lady and her family. I care take for a woman with CBD. She is about 3 years into the diagnosis. Thank you for the information. You are welcome…I’m always glad to hear when the information that I work to provide here helps someone else. 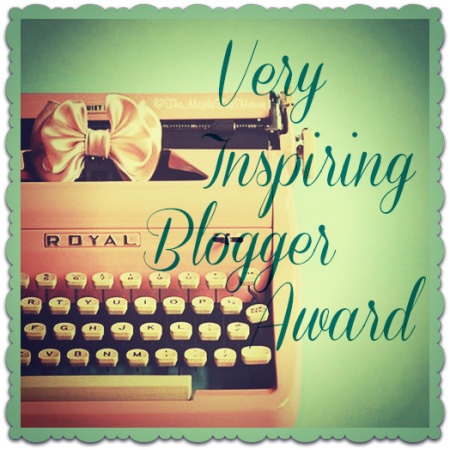 That’s the reason why this blog exists. Thank you so much for your comment. And prayers and best wishes for you and the lady you’re caring for. I take care of my husband and he is doing well with his feeding tube. I also know for him it was starvation or life and my family could not do that to him. Si for us it was a good decision. He has gootten better and is progressing slowly. I also know that some doctors now regularly use finding tubes to extend people’s life with feeding tubes. To each their own. My husband is glad to be alive. Although if he changed his mind , it can easily be taken out. Are you still here? Your post was 2 years ago. Did you change your mind about the feedi g tube? Do you have cbgd? If not. I dont think you could possibly no if you wohld want a feeding tube or not. I thought like you a few years ago. But now that eating is becoming an issue. I have changed my mind. Carolyn, I do not have CBD (however, I have deep and extensive personal experience with dementias). Choosing a feeding tube is an individual choice. I personally would not (and have specified that and any other life-extending measures in my advanced directives) choose a feeding tube if eating/swallowing were impossible. For me, that choice would prolong a life that is losing all quality and, personally, that is the last thing I want because quantity of life without quality of life would be, for me, the worst possible scenario that a human being could face. My husband has CBD, he was diagnosed almost 7 years ago and is in the latter stages of his disease. He cannot do anything for himself, he can still swallow, food has to be pureed or thickened with liquids. This is a terrible disease, I love my husband dearly, this has been terrible to see the illness take over. Christine, I am so sorry that you and your husband are going through the journey of dementia with CBD. It is indeed a terrible disease and I know that it has broken your heart to see it take over the life of the man you love. Sending love, prayers, and hugs to both of you. I have read these posts and CBD is such a cruel condition. My mother is 73 and has suffered with CBD for about 8 years. She is now on the final stages and in hospital after being cared for by my father. She has now not had any food or fluids for 5 days as she can’t swallow. The saddest thing is that through everything she had always been totally aware of everything and not seemed to suffer much from direct memory issues. So when she lay there unable to speak or make any facial movements she would try and communicate by squeezing her thumb, the only limb that could still move. Very sad, but I am actually hoping it all ends very soon for her as she is in such pain. My heart breaks for you and your mom and dad as your mom ends her journey with CBD. It is incredibly sad and incredibly painful, but the end of the suffering is often sometimes great relief, although the grief never quite leaves you. My very best to you and your parents as you take this final leg in your mom’s journey through dementia. Thank you for your comment, Michele. You are absolutely right that each of us has the ability to make choices concerning our care and that varies from individual to individual. I’m glad to hear about you and your husband and pray for God’s blessing on both of you as you go through this journey together. Bob was in on the feeding tube decision with our sons. I believe it was the right decision for him, he had 2 effisodes of aspiration, and I couldn’t chance that again when he was at home, he black out and almost died. I had to put him in a care facility after I broke my arm after a fall, and that was a blessing since I can just be his wife and love and care for him when I visit, instread of diapers and feeding, he’s sleeping a lot these days and not in a lot of pain… he is aware also, and that breaks my heart… prayers to you. My husband is 6 years in with cbd, we had a feeding tube put in 3 months ago, he looks so healthy and watches tv at the facility I have him in, but his quality of life is so poor and he has lost everything, speech, movement, eyesight, real food , sometimes I wish it would end for him, he’s in a little pain in his left leg, we have been married 48 years, I visit him twice a day, and massage his legs, athat all I can do. I hate hate this disease. I’m so sorry to hear about your husband, Jo, but send best wishes and heartfelt prayers for you both as you go through this journey together. My mother who is 66 has CBD. She is about 4 years into the disease, and is suffering from stiffness, inability to use her fingers & hands, she cant speak any longer and is only able to make sounds. Despite all this, her mind is sharp and she is very opinionated about her daily life. She reads the papers every morning, and her Kindle in the day even though she has indicated that she cant comprehend the written word so well any longer. She has a physiotherapist who comes thrice a week and a daily yoga teacher. We have a care giver who is with her all day. She looks sad and frustrated. Im dreading what will come ahead. How will we manage? How will we watch her slip away? I am so sorry to hear about your mom suffering with CBD. I can only imagine your apprehension about what lies ahead, but I hope I can encourage you, from my experience, that even when it seems that managing is impossible, we find a way and we find a way to give our loved ones the best quality of life we can give them, even at times in self-sacrifice to make sure they’re okay (and then we fall apart, at times, after they’re gone). It’s hard to watch them slip away, but there comes a point of clarity when their suffering is greater than anything else, and it becomes easier to let them go (don’t get me wrong…there is nothing easy about death: https://goinggentleintothatgoodnight.com/2015/11/13/grief/ …but knowing our loved ones aren’t going to suffer anymore gives us the ability to make peace with it). Hugs and best wishes for you and your mom.